The SeaCure X Type Model is a unique, custom mouthpiece designed to fit your mouth, teeth, and gums perfectly, providing uttermost comfort and eliminating jaw fatigue sometimes experienced with conventional mouthpieces. Being moldable, it can actually enter the mouth all the way to the rear of the jaw employing all of the diver's teeth for better regulator retention with less muscle effort. Additionally, thanks to its X shaped profile, this SeaCure model is significantly less bulky and does not cause gagging. 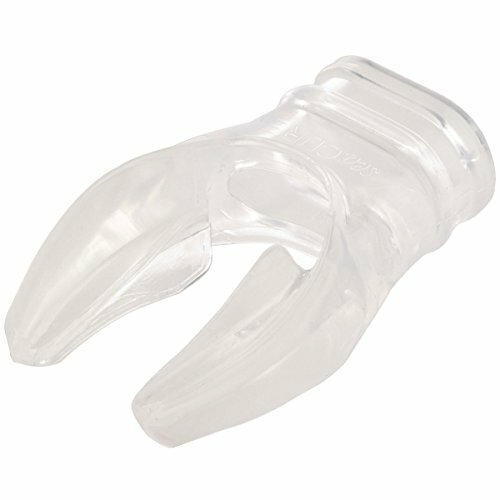 The mouthpiece also includes a sealing attachment with a bite limiter which eliminates the possibility of over closure during the heat molding process. Complete molding instructions are included with each mouthpiece. Keep in mind, the mouthpiece can be remolded, if you are not satisfied with the first result or if dental work changes the bite. The SeaCure X Type Model Mouthpiece comes in 5 sizes: SeaCure 1 - fits standard orifice regulators (size 1-1/8" x 1/2") SeaCure 2 - fits intermediate size orifice regulators (size 1-3/16" x 5/8") SeaCure 3 - same diameter as a size 1 with double retention ribbing SeaCure 4 - fits orifice regulators and many rebreathers (size 1-5/16" x 11/16") SeaCure 5 fits orifice regulators (size 1-7/16" x 13/16") The full list of compatible regulators is constantly updated and can be found on the manufacturer's website. BIG NEWS! SEACURE ANNOUNCES IT'S NEW "X TYPE" MODEL. AND SEACURE CAN NOW FIT APEKS, POSEIDON + MANY REBREATHERS! 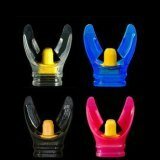 Finding a mouthpiece that offers both unbeatable security and comfort has forever been the diver's dilemma. SeaCure has been the definitive answer since 1992. The newest model, the "Hi-Flow" offers an expanded port, which provides increased air flow. It also includes a new one piece molding and sealing attachment. This device allows for easier molding and is then used to protect the regulator from debris and unwelcome guests during storage. The Hi-Flow is available in clear, blue, black and pink.